Please Note ! We value and respect your privacy. 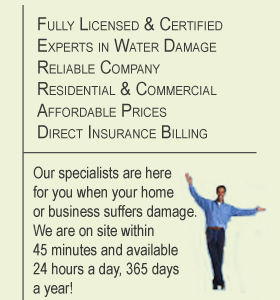 911 Water Damage offers 24/7 immediate emergency service! Whether from a natural disaster, broken pipe, or other devastating situation, when large amounts of water floods your home or business you need a company with the water removal services you can rely on to get your property back in shape and your life back on track. Due to our high standards of workmanship, dedication, strong work ethic and commitment to each project along with affordable prices, 911 Water Damage have established ourselves as the premier company for Property Damage Restoration and Cleanup. Our skilled technicians are on call 24/7 and use their experience, knowledge and state- of-the-art equipment to safely dry, deodorize, and disinfect the areas with flood damage or water damage. 911 Water Damage technicians who are part of 911 Restoration Inc. Company ensure that any effected areas that are damaged due to water or flood damage are dried completely and treat the mold and make sure that the microbial growth is eliminated By acting quickly we can increase the chance of salvaging materials and reduce any mold that could develop and limit the likelihood of structural problems. Our certified professional technicians have been providing both residential and commercial water damage restoration and flood restoration services for many years in your area. 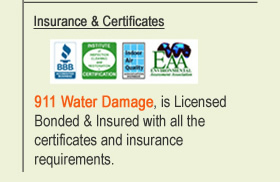 Call us today for a FREE consultation on our water damage services and learn why 911 Water Damage in one of the most highly respected companies foe water damage.